With the Ram 1500, you can choose the available class-exclusive Four Corner Air Suspension System. This suspension system provides you with reduced drag and enhanced efficiency when you are driving at highway speeds. Models that don't have the Four Corner Air Suspension System will get the class-exclusive Active Air Dam, which will reduce drag by extending downward by 2.5 inches. 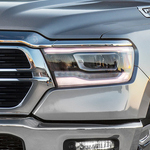 The Ram 1500 offers the available 5.7L HEMI V8 engine, which features the eTorque Mild Hybrid System. This engine produces best-in-class V8 towing and best-in-class V8 4x4 combined fuel economy. This engine can reach 395 horsepower and 410 lb.-ft. of torque.